Kouichi Kimura, founder of FORM in Yagura, was commissioned to build a photographer’s house in Japan’s Shiga prefecture, a complex residence demonstrating the influence of art on everyday life and vice versa. Recent projects by architect Kouichi Kimura of FORM include a photographer’s home in the urban part of Japan’s Shiga prefecture. 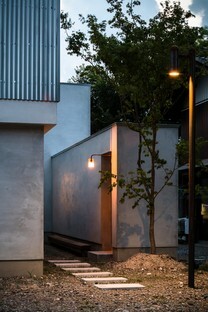 With a reputation in his homeland as a specialist in the design of new homes, Kouichi Kimura approaches all his projects with what has been described as poetic minimalism, achieving a delicate balance between dialogue and privacy. The combination of art and life has always been a great literary topos, as demonstrated by the many museum homes preserved intact over the years to represent a practically indissoluble symbiosis of individual and artist. 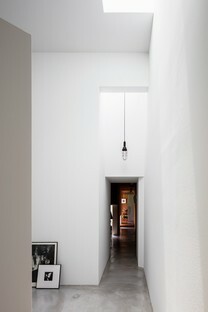 In many cases, such as the home of Giorgio Morandi in the province of Bologna or Gustav Klimt’s recently opened house in Vienna, the artist converted an existing space not originally designed for use as a studio; in other cases the client commissioned an architect to create a space appropriate for a specific individual and artist. 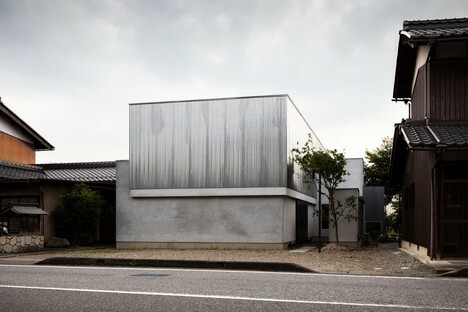 In this project in Shiga prefecture, the photographer asked for a completely new building in which his profession and resulting specific requirements, public and semi-public in nature, could coexist with his strictly private life. The chosen site is by a major road which cuts the neighbourhood in half, separating the private homes along the road from a sanctuary in the woods. 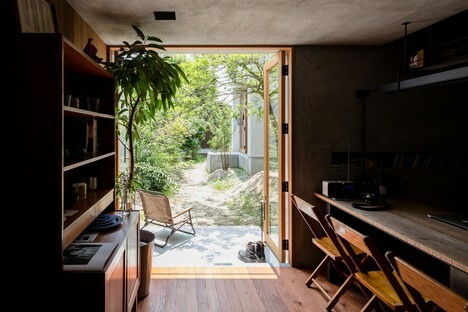 As in much Japanese architecture in urban areas, landscape has very little importance in the architectural construction of the new home, which is highly introspective. The decision to set the building back from the road is the first sign of its detachment from its context and of the search for a privileged point of view from which to see the world and be seen. 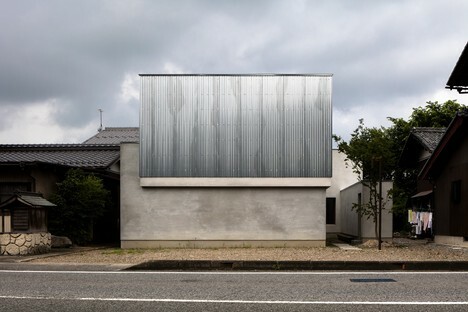 The side of the house facing the road has no windows, but it is not mute, as the first level, covered with white plaster, is topped by a second level covered with galvanised steel cladding which juts out slightly over the road. 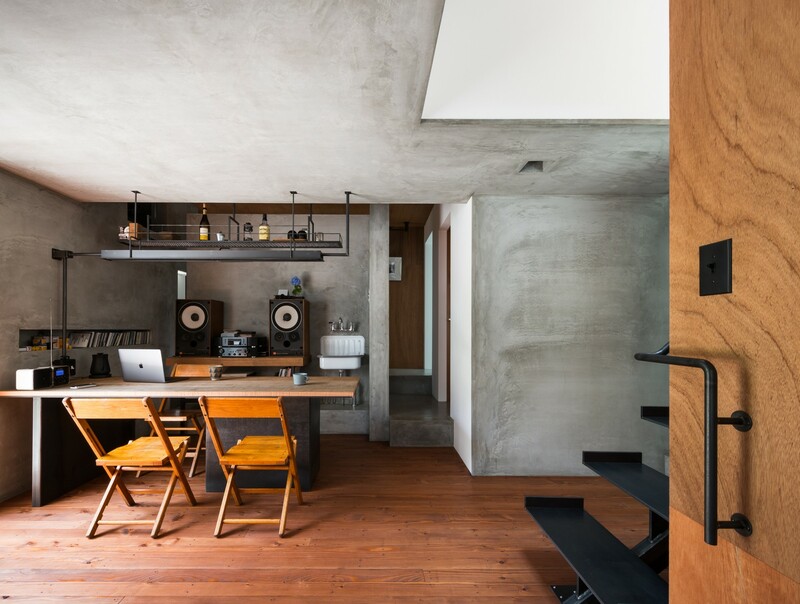 This breakdown of volumes immediately reveals the house’s dual soul combining spaces for the individual and for the artist. The concept is dematerialisation of this compact wooden structure with its mortar finish, topping it with a volume that gives off light, with a lightweight impact. 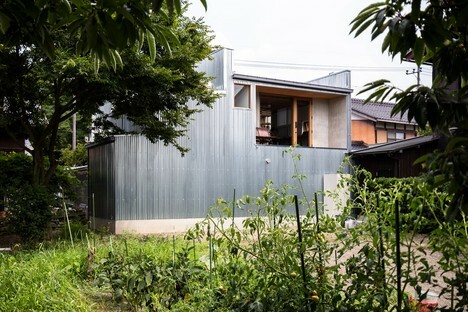 This element, along with the flat roof and the destructured floor plan we are about to describe, makes the building stand out in a uniform neighbourhood of timber-faced homes with gabled roofs. 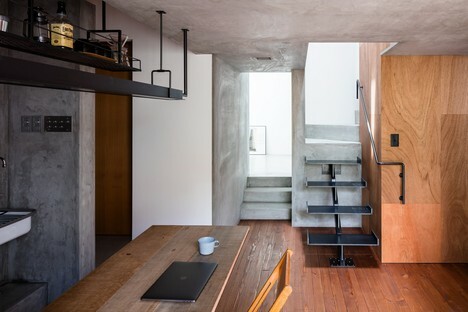 In his attempt to define the man and the artist, Kouichi Kimura performed a well thought-out analysis of the client’s concrete organisational requirements, giving up on the idea of arranging the spaces by function right from the start. Looking at the building’s floor plan, we note that the main entrance is located off to one side, in a slender volume only one floor high which serves as an entrance foyer. 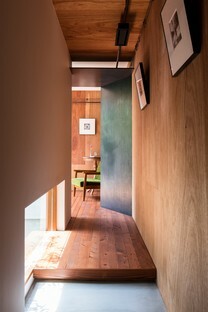 The proportions of this welcoming space are not the traditional ones, for it is a long, blind corridor which forces guests to go from daylight into semi-darkness, then through a second door into a space almost entirely in shadow, except for a slice of daylight entering through a skylight and falling on the back wall. This first corridor thus turns out to be the entrance to, and the first contemplative moment in, a circuit of rooms arranged around the perimeter of the home, like true exhibition spaces, characterised by an emphasis on perspective, by unusual points of view, and by partitions that do not go all the way up to the ceiling, allowing us to imagine scenarios and possible ways of framing a photo. 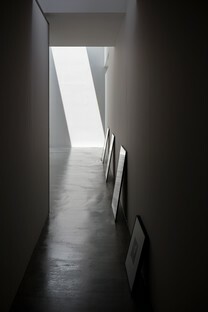 The artist’s world, photography, thus contributes to the definition of the lighting of this space. 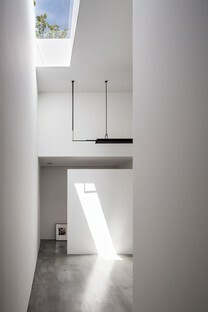 White walls and glossy concrete floors reflect daylight, which sometimes enters from above, sometimes from below. 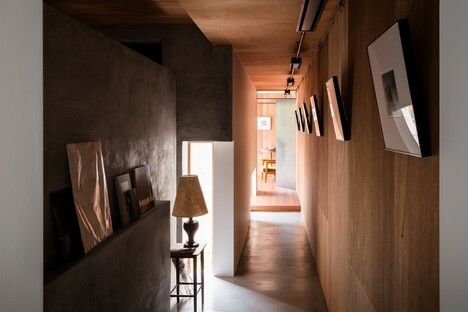 This L-shaped exhibition route embraces both the big double-height studio and the living room of the home, which are connected. The upper level, containing private spaces, is also visually linked with the studio through a big glass wall. The photographer’s equipment, vintage furniture, musical instruments and artworks are placed here and there in no particular order except that of satisfying the client’s aesthetic sense. It’s impossible to say whether we are in the photographer’s office or in his home, because every room seems to prepare for the other, just as everyday life provides inspiration for his profession, and vice versa.